Witherwood Reform School Blog Tour! Today I have the pleasure of being one of the hosts of the Witherwood Reform School blog tour. I will be reviewing the book and then there is a contest at the end! Also be sure to check out the rest of the book tour, linked below! Synopsis: After a slight misunderstanding involving a horrible governess, gravy, and a jar of tadpoles, siblings Tobias and Charlotte Eggars find themselves abandoned by their father at the gates of a creepy reform school. Evil mysteries are afoot at Witherwood, where the grounds are patrolled by vicious creatures and kids are locked in their rooms. Charlotte and Tobias soon realize that they are in terrible danger—especially because the head of Witherwood has perfected the art of mind control. If only their amnesiac father would recover. If only Tobias and Charlotte could solve the dark mystery and free the kids at Witherwood—and ultimately save themselves. When I was younger I read the Series of Unfortunate Events books and liked them pretty well. Witherwood Reform School is in that same vein of books. It is similar to A Series of Unfortunate Events in that there is a narrator who says things that are not exactly hopeful throughout the book. It is also similar in that it is a book about some kids who are in a horrible situation and it never seems to get better. I liked Witherwood Reform School. It was a fast read, with lots of twists and turns and a scary school that just continues to get creepier and creepier as the book goes on. This book is also good at making you think things might get better and then bam, something else happens. Tobias and Charlotte are not the smartest kids in the world or else they wouldn't have ended up in the situations they did. But they are resourceful and smart to a point, I also liked their relationship. Also their reactions to things that happened were genuine. I have always loved books that take place in boarding schools or reform schools because there is so much that can be done to add mystery and intrigue to the story. Witherwood Reform School definitely falls under that category. In fact I wish there had been slightly more information given about certain aspects of what happened, and things that appeared. Though keeping the reader almost as in the dark as the characters adds to the anxious feeling you get when you know something bad is going to happen. Hopefully those things will be addressed in later books because I would be really interested to know more. Overall I liked this series and would recommend it to kids/adults who are fans of A Series of Unfortunate Evens or who want a creepy read that will make you stay far away from random mansions. 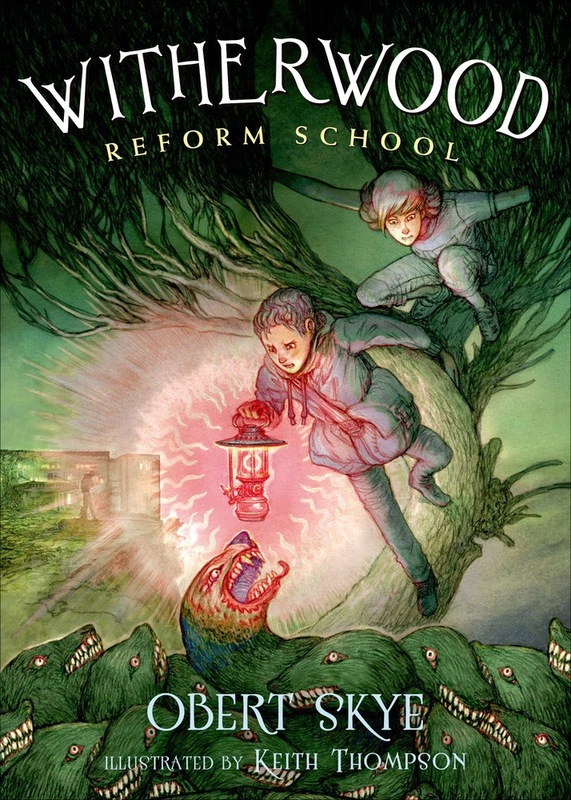 Enter to win a copy of Witherwood Reform School! Open to US addresses only (sorry) ends 2/252015 at 11:59 pm central time.